I was writing a PowerShell Script for the 2008 Window Scripting Games (are you in the games?) and I found writing a long complex script using only a text edit to be really tiring. I blogged about a PowerShell IDE two years ago, but for whatever reason it didn't stick. I didn't start using it regularly and fell back to the command-line and notepad. However, while I was writing scripts for the Games I got fed up with just the command-line. I went back to http://www.powershell.com and starting coding in the PowerShellPlus Editor. You can get it free. Schweet. This IDE has come so far and it's a joy to use. It's got a debugger and intellisense and syntax highlighting. It's like SQL Analyzer, but for PowerShell. 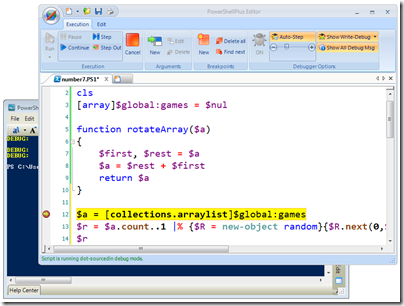 It's a great way to not only learn PowerShell but it's very powerful for advanced users. Seriously, go get it. UPDATE with $50 off COUPON: From the comments: "So we have a special deal for loyal hanselman fans..For the next 2 weeks we will give $50 off our price of $129, giving you our PowerShell Suite for only $79. However we've only set up the coupon code with google checkout, so you'll have to checkout through there. So basically add the item to your cart, and check out with Google checkout and use the coupon code: hanselman and you'll be on your way." Do you ever get tired of having a different editor for every kind of file you edit? Sometimes this drives me nuts and I think about becoming an Emacs monk, but then I conclude editors like the PowerShell IDE offer too much to give up on. I went to the powershell.com and noticed that PowerShell+ is only free for non commerical use. At $129 for a commercial license, I still think it is a good value for those who do anything complicated with PowerShell. John - If the fonts are the same, and F5 is the "do it" button, I don't notice. I've been a huge fan of PS+ for a while. PowerGUI compares pretty well well to the PS+ editor in terms of the editor itself, but that's where the comparisons end. PS+ is a full-featured console which happens to have a great editor. PowerGUI is primarily a GUI script repository which happens to have a very good editor. I find the two tools don't compete in the exact same space. Both are quite useful. I'm glad you like it, i presume you've noticed a fair bit of improvement since our early NDA betas you were involved with. We are always open to more suggestions and feedback, of what works and what doesn't for people. One thing we are needing to improve is documentation and tutorials, and many of the most powerful features of our tools, only make sense when you know the why. So we have a special deal for loyal hanselman fans..For the next 2 weeks we will give $50 off our price of $129, giving you our PowerShell Suite for only $79. However we've only set up the coupon code with google checkout, so you'll have to checkout through there. So basically add the item to your cart, and check out with Google checkout and use the coupon code: hanselman and you'll be on your way. What an incredible tool. As a PowerShell noob, this IDE makes life much simpler. The learning curve just flattened a bit. On a somewhat related note... Any idea if the Insert Code feature of dasBlog will support PowerShell scripts in the future?